If you would like to add an event to our events list please click here to contact us with the details. The expectations and the energy were high as we all began to arrive at Purley Chase on Friday 6th July for our ‘home grown’ conference. This year, the council had decided to plan and organise a little differently: we had three Herbal companies providing stands with their products, as well as lecture time; members had volunteered to lead and speak in some of the sessions which meant we were really tapping into the wealth of wisdom and knowledge within our own ranks. We had running along side this, the option of ‘Open Space’, where anyone who wanted to spend time discussing or exploring a certain subject with others could do so. We had also decided to run it as a free event, with delegates just having to pay for their ‘bed and board’. With the added advantage of the conference being marketed on Eventbrite for the first time, we attracted a large number of non-members. It was a real delight to be part of the welcoming team, giving out welcome packs to members and non-members alike and guiding them as required to the layout of Purley Chase. The ‘buzz’ that began from the moment the first delegates started arriving, did not really stop for the whole weekend! This feeling of high spirits combined with enthusiasm to learn new things and to collaborate together made the whole three days a tremendous success. We had chosen the venue once more, as it is so central, while also providing such a rich natural environment. As the weekend progressed and we received so much positive feedback with regard to all aspects of what Purley Chase offers, we came to the conclusion that it really made a lot of sense to book it again for 2019 and this is what we have done. 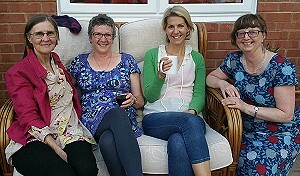 We were provided with a delicious supper where old and new acquaintances gathered around tables and shared tales of their journeys along with their expectations of the weekend. This led us to our first lecture by our very own Judy Evans who gave us further insights into the links between our environment and the development of osteoporosis. After a hearty breakfast the next morning, more delegates arrived and we were ready for our session led by Joe Nasr from Avicenna. Joe is a joy to listen to and we were all fascinated by his lecture on aromatic plants as well as being given the chance to smell the divine fragrances of the distilled herbal waters he had brought with him for us to experience. The rest of the day, delegates had only one problem: there was a choice of two different speakers for each time slot and so decisions had to be made! There was a great selection on offer, from Rose Holmes from Riohealth giving a clear update of the treatment of Lyme’s disease, to meditating with the plants outside in the form of plant spirit medicine; from James Fearnley regaling us with bee tales from his own company, Herbal Apothecary, to Caroline Daniels giving her own very compelling and personal journey in treating and healing breast cancer. 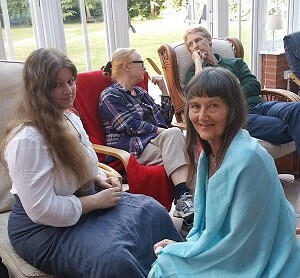 John Smith gave a very enlightening talk on attars while Barbara Wilkinson did a whistle stop tour of some of the healing qualities of the herbs in the gardens of Purley Chase. Dr Edward Thompson completed the day with a very much required lecture on red flags, something that is so important in order for us to be practicing as safe and responsible practitioners. It really was a day packed from start to finish with so many herbal delights, insights and learning and all with the sun streaming in on us and the sounds of Nature right outside for us to enjoy. It was a magical mix indeed and one that everyone who was there, said they thoroughly enjoyed. There was much ‘buzzing’ going on between all the attendees during dinner after such an enlightening programme of events. For some, this continued into the bar area in the evening, where certain musical prowess was on offer and informal chat to finish off the day. The sun rose obligingly again the next morning, with not a cloud in sight and so began our final day. Joe Nasr continued to explore the world of aromatic herbs, giving us detailed information on the distilling process and the efficacious properties of some of the herbal waters that are produced from this. The AGM, which had several non members attending as observers, then proceeded and much was discussed with a general positive feeling about our next steps forward, but also how enjoyable the conference had been. The whole wonderful weekend was rounded off with a scrumptious lunch. The staff at Purley Chase really did us proud and we left with stomachs happily full, as well as heads brimming with newly learnt skills and knowledge. 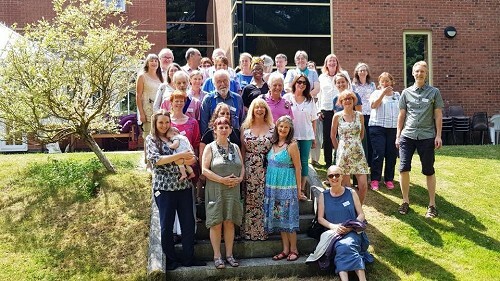 There were many new connections made throughout the conference and all fed back that the warmth and friendliness that had pervaded the event, had made it one to remember. 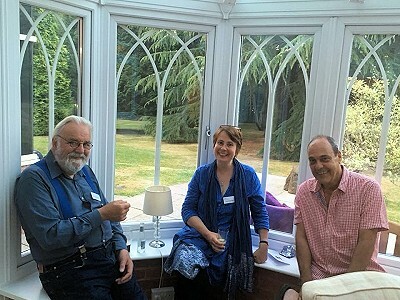 It was a warm and pleasant Friday afternoon when we arrived at the beautifully appointed Purley Chase for another weekend of delights, surprises and rich, valuable learning as well as highly valuable connections with our herbal colleagues. After initial greetings alongside sampling scrumptious treats with our welcoming drinks, we all settled ourselves in to this charming place of peace and calm, readying ourselves for a stepping off from the usual hectic pace of life to a rather more gentle and reflective space. This is the gift of coming away for a weekend conference together in such tranquil surroundings. Stopping to take stock of all we have achieved and all we want to focus our energies on in our herbal world is essential if we are to move forward effectively and this is what we achieved. Our first exploration into deepening our knowledge began after an early dinner. It was led by our very own Judy Evans, who is a naturopathic Herbalist, talking to us about natural ways of treating the menopause. Judy used her own experience of previously very difficult monthly cycles to demonstrate how effective natural approaches can be. In the past, she had gathered huge amounts of research in order to help herself and came upon the work of John Lee MD and his insights and treatments using natural progesterone backed by many years of clinical research. We all took in this information (as easily as this remarkable cream is absorbed into our skin!) with great interest and, for me, it certainly highlighted an area that I would want to develop in my practise. Judy covered as much as she could in the time allotted and gave us a great overview of the various ways that we can all approach this rather challenging time of life with our clients. It has to be said, some of us of a certain age, were already on the website ordering the natural progesterone cream before we went to bed! The next day dawned bright and we all had great expectations of the forthcoming day. We were not disappointed! What a fabulous day we had with not only a fascinating and moving narrative but also lively discussion with plenty of laughter. Our speaker for the day was Dame Commander Annette Montague-Thomas. For those of you who have not been fortunate enough to have met her, Annette is one in a million: she brought energy and passion to all she spoke about, enlightening us with her own particular story and in doing so, motivating us all to follow our own herbal paths with courage and determination. Annette is founder of The Global Natural Healthcare Trust Charity and she took us on her journey from early work with UNICEF in Africa to how she came to set up her own charity in 2000. This all began with Annette seeing a documentary about the HIV/ AIDS pandemic and how this was devastating townships in South Africa. She was so moved that with her innate steely determination, she flew out to Africa with a vision and a mission in her head and her heart, not entirely sure where she would begin, but knowing that she must, at least, try. There aren't many who would have fought in the way Annette did and still does, against such odds and brought into being an exceptional medical centre with a team treating many people each day; a farm where all the herbs used are grown; a children's hospice; a children's unit (The Cuddle Centre) and an adult respite centre. All this has come about from one woman working tirelessly: finding solutions, being proactive, engaging others, collaborating with funding agencies while using her skills as a herbalist to achieve her goals. We all, I think, sat in the lecture room that day, silenced at times with awe that such an undertaking had been achieved. Annette has such a gift of storytelling and delighted us with anecdotes that literally had us howling with laughter. She was also open to questions and discussion as her story unfolded, which gave a beautiful flow to the day. In the latter part of the afternoon, we focused on the devastation that Lyme's disease can have on people's lives with Annette giving us the benefit of her own experience in meeting and treating a young girl with this illness. This was an opportunity as well, for those who also had knowledge and involvement in dealing with Lyme's, to share this with the rest of the group. There was much to communicate on this subject and we closed the session with renewed interest and new ideas about how to approach such an overwhelming disease. This had been a day packed with creative energy. We had heard a story that stimulated us to move forward in our own professional lives and left us with a feeling that with the right combination of vision and action, anything could be achieved. We also had an insight into the incredible power of herbs and how they had brought their own particular healing to this community when in the hands of a skilled practitioner. After such a highly charged day, we were very happy to tuck into the usual delicious supper and those who still had the energy partook of an evening of singing, music and conversation, entertained by the talent within our own membership. The Sunday morning was dedicated to the AGM, reports from the council and further discussion of topics raised the previous day. There was a lot of positive energy amongst us, as we planned the next few months and how we would engage more with our local communities, as well as tackling political issues in the wider world of herbalism. 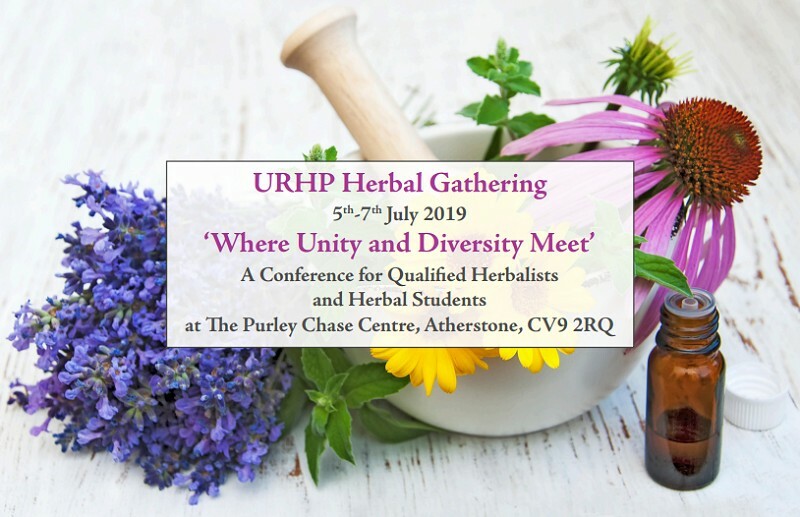 It must be said that there was much beneficial collaboration between us all and we came out of the morning with a real feeling of moving forwards and working together for both the URHP and our precious plants, which after all, deserve much gratitude for the gifts they bestow on us as medical herbalists. 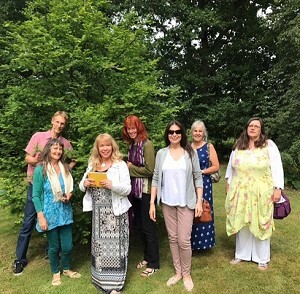 Our nurturing weekend was rounded off for those who were able to stay, with a magnificent herb walk led by Barbara Wilkinson, who has the true ability to let the joy of each herb shine through with her narrative and deep understanding of the plant kingdom. This was a hugely successful conference, where, with our ability to stop, reflect and plan, we were able to, not only enjoy the compelling content our speakers laid before us, but also to step forward with new creative ideas and plans for ourselves and our professional association.